It has been an entire year since the new changes in the English translation of the language used in the Sacred Liturgy which were introduced to the Church in America on the First Sunday of Advent in 2011. By most accounts it has been a success, but not without some criticism. One example was a reader of a major magazine that focuses on religion and culture who wrote to the editor to criticize an article written by Anthony Esolen about the changes. Professor Esolen had praised the new translation not only because of its accuracy in relation to the official Latin prayers, but because of its beauty and its felicitousness for worship of the the Divinity. However, the writer would have none of it. He indicated that he had converted to Catholicism in the 1970s, and had been attracted to the Church by what sounds like a liturgical style described by Kieran Flanagan described in his book Sociology and Liturgy as “the consumer-friendly rites…happy clappy events full of meet and greet transactions” common in so many parishes of that time (and in some even today). His lament was that, Esolen’s comments aside, the liturgy should be plain, brought down and made accessible lest it be beyond the common congregant’s ability to engage in the process. But as Professor Esolen stated in his response to the reader’s letter, who is to say that the reader would not have been even more attracted to the Church had he been given the Sacred Liturgy in all of its depth, and breadth, and spirit? It is surely fortunate that this man found his way into the Church, but his journey to the Church of Rome and his continued attachment to it over the years may have been in spite of the rockaliturgy that he remembers so fondly. The sad fact is that for all of the talk after Vatican II about the need for relevance and accessibility in worship to bring Catholics, especially Catholic youth, to a fruitful understanding and experience of the Sacred Liturgy, those efforts failed the failure of foolish pride. The dumbed down, horizontal and sentimental minimalism that was presented to Catholics, old and young, after the Council by the liturgical deconstructionists as the true liturgy of the Church was something of a fraud because it was much less than the real thing. And as is the case with fraud generally, there were consequences. For the most part young Catholics and many of their elders apparently were not very impressed or inspired by the silliness of the liturgical innovators. When the banners bearing relevant messages about issues that were relevant only to self-anointed “liturgists” were taken down, when the liturgical entertainers had vacated the sanctuaries, and the incense smoke from the clay pots danced down the aisle in the hands of barefoot maidens had cleared the air, the relevant priests and their relevant liturgists found themselves mostly alone. The novelty wore off. Most of the kids and many of the adults, seeing nothing of substance in the common and the profane, were gone. Standing before wooden altars made to look like Dairy Queen tables, in “worship spaces” designed to look like any common church hall, emptied of the tabernacle and the Real Presence, the innovators were faced with what their arrogant pride had blinded them from seeing. If worship of the divine is devoid of the transcendent and the element of sacrifice, and reduced to meeting at the dinner table for fast food and some pleasant conversation, it is not worth the effort to make the commitment to be consistently present, and to immerse oneself heart and soul in the act of public worship which we call the liturgy. Certainly not for the inquiring, impressionable, and distractible minds of youth, who especially need to be guided and supported in seeking the fullness of the liturgy. Mainly what the innovators brought into the sanctuary was less worship of the omnipotent God than human conviviality in a religious setting. This was misguided, and damaging. The Catholic Catechism teaches that in “the Eucharist the Church is as it were at the foot of the cross with Mary, united with the offering and intercession of Christ.” #1370 “The Eucharist is thus a sacrifice because it re-presents (makes present) the sacrifice of the cross…” #1366 “In the earthly liturgy we share in a foretaste of that heavenly liturgy which is celebrated in the Holy City of Jerusalem toward which we journey as pilgrims, where Christ is sitting at the right hand of God, Minister of the sanctuary and of the true tabernacle.” #1090. 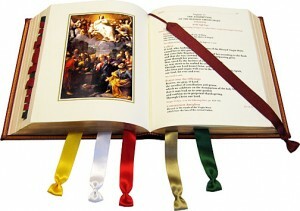 Therefore, whatever we say and sing in the Sacred Liturgy should express these realities. That 1970s convert to Catholicism was entitled to more than what he received, even if he does not know it. The self contained, homegrown, and earthbound rockaliturgy of the deconstructionists and the innovators did not measure up then, and does not now. It is a golden calf constructed by the arrogant and the foolish in a vain attempt to make God into their own image, and on their own terms. It is the Divine Plan in reverse. Robert J. Gieb has practiced probate law in Ft. Worth, Texas for forty years. He is local counsel for Catholics United For Life of North Texas.